The OptionsWest free compounding calculator is a compounding future value calculator designed for building an investment plan. It is a great tool for “running the numbers” on your future wealth and retirement. We never found a good compounding calculator that was designed with the market investor in mind, so we built one. Designing your own personal “Money Model” with your passive income objectives is now straightforward and simple. The Calculator is an Excel file, so you will require Microsoft Excel to use the calculator. Enter an original investment amount, the monthly percentage return you expect to receive from your trading strategy, and the number of years you need to meet your goals. You can also add an additional monthly deposit that you could consistently contribute to the account, as well as, an annual capital gains tax rate. 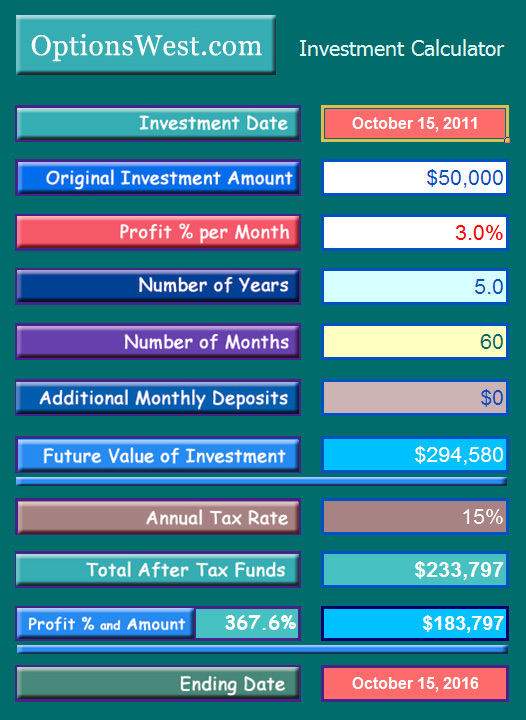 The calculator will compound your returns both before and after tax and show your profit and balance fund totals. You can also enter a start date and the calculator will give you your ending date. Enjoy. FYI… We never share your email address with anyone outside OptionsWest … Promise!